All special droppable legendary materials were abruptly and controversially removed from the game in Patch 2.0.6. See below. Post v2.06, only legendary materials remaining in Diablo 3 and Reaper of Souls are ones created by salvaging legendary items, along with the special legendary materials related to the Infernal Machine and the Whimsyshire opening Staff of Herding. Patch 2.3 added more legendary materials, the Horadric Cache mats, used largely in Kanai's Cube. There are two types of legendary material that are salvaged from legendary and set items, including crafted legendary/set items. One material comes from each salvaged item. They may also directly drop from Rift Guardians, in the appropriate level range. Fiery Brimstone -- Level 1-60. Forgotten Soul -- Level 61-70. Forgotten Souls are the chief bottleneck for all end game crafting and legendary enchanting, and most players feel it is impossible to have too many, since any new legendary item might require dozens of enchants, costing a Forgotten Soul apiece, to get the perfect affix. There are a number of legendary materials required to create the Infernal Machine and then to craft a Hellfire Ring in Reaper of Souls. The 4 types of keys drop only from the KeyWardens, and the 4 Demonic Organs drop only from the Ubers. See those articles for full details. Diablo 3 has just 3 keys, 1 Machine, and 3 Ubers for 3 Organs. That info is also covered in the Infernal Machine article. Whimsyshire is the rainbow-colored Easter Egg level in Diablo 3, which remains accessible in Reaper of Souls. Four legendary materials, the Gibbering Gemstone, Leoric's Shinbone, Liquid Rainbow, Wirt's Bell, are required to create the Staff of Herding, which is used to gain access to Whimsyshire. Going there is required in some cases, since two of the legendary materials can only be found from Uniques in Whimsyshire. See the Whimsyshire article for full details. Legendary Materials made a sort of return in Patch 2.3 when five new Horadric Cache materials]] were added to the game (each using an icon of a former Legendary Material). These five "cache mats" drop only from Horadric Caches, and are required for most level 70 legendary and set crafting in Patch 2.3 and later. Cache mats are also required for the most powerful recipes in Kanai's Cube. Legendary Materials is an archived article about material previously included in Diablo 3. However, it has currently been removed or the article contains outdated facts. The information is stored in Diablo Wiki for posterity. Please note: Links in this article lead to both updated and archived material. Unique crafting materials are no longer required. Legendary crafting materials will no longer drop. Level 70 crafted sets and Legendary items with unique properties now require additional Death’s Breath. Level 70 crafted Legendary items without unique properties have had their Death's Breath costs removed. Death’s Breath is no longer required for most Artisan training costs. The Mystic no longer requires any Death’s Breath to train. The Blacksmith and the Jeweler now only require 1 each to learn the first rank of level 11. The remainder of this page is untouched from pre-Patch 2.0.6 for archival purposes. Legendary materials are found in Reaper of Souls (a few are also found also in Diablo 3 version 2), and required for all legendary and set crafting. While all the regular materials are created by salvaging items, all legendary materials except for Fiery Brimstones and Forgotten Souls must be found in the world. They can be difficult to obtain; almost all legendary materials drop only from certain purple Unique bosses, and these are largely random in their location and frequency. Like normal types of Materials, Legendary Materials have no function on their own, and are used exclusively in the crafting of set and legendary items. Players generally find a legendary crafting plan, teach it to the Blacksmith, and then view the details of that armor or weapon before deciding if it's worth trying to find the legendary material required to make it. That's what this article is for, with info on every legendary crafting materials, the legendary/set plan they are tied to, and the name and location of the Unique bosses capable of dropping them. Legendary materials drop more often on higher difficulty levels. Their drop rate was tripled in Patch 2.0.4 shortly after Reaper of Souls' release, making them all much easier to find. The figures are the percent chance the legendary material (or Deaths Breath will be dropped by a valid source. All legendary materials except Adventurer's Journals and Griswold's Scribblings can only be dropped by Unique (purple) bosses of a certain type. See the legendary materials article for full details. The same drop rates apply to Death's Breaths, though they have many more possible drop sources. The following 41 legendary materials are required for crafting various legendary and set items. 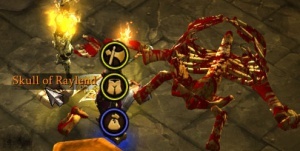 The Adventure's Journal and Griswold's Scribblings can drop from various objects from level 10-70, and both are present in Diablo 3. All the rest are Reapr of Souls only, and only drop from level 70 Uniques (Purples) of the correct type. This table is meant for quick reference. Refer to the individual legendary material articles for more details on the crafting purposes, scarcity, farming tips, and more. Bounty: Monster may appear as a Bounty target. Fixed: Monster appears in this location every game (may differ between Story Mode and Adventure Mode). Item Set: Bonuses for equipping more than one item from this item set. Monsters listed are confirmed to drop the materials. Others may drop but are not yet confirmed. Feedback in the forum thread is welcomed. Breakable and clickable objects (except chests). Seen from loose floor tiles, urns and vases, barrels, dead bodies, etc. Bounty -- Pyres the Damned Act 4, The Silver Spire Level 1. Fixed, Bounty -- Izual, Act 4, The Great Span. Haziael, Act 5, Battlefields of Eternity. Event -- Erelus, Act 5, Battlefields of Eternity. The Crag of Eternity, spawns with "The War That Time Forgot" event. Celik, Act 5, Pandemonium Fortress Level 2. Unique Cultist Summoners and their Unique Hellions (Demon Dogs). Cadhul the Deathcaller. Act 1, Southern Highlands. Bounty -- Jezeb the Conjuror, Act 1, Leoric's Manor. Bounty -- Krailen the Wicked, Act 1, Leoric's Manor. Bounty -- Yeth, Act 2, Road to Alcarnus. Bounty -- Shondar the Invoker, Act 2, Alcarnus. Pontius, Act 5, Westmarch Commons. Bounty -- Severclaw, Act 3, Arreat Crater Level 1. Bounty -- Scorpitox, Act 3, The Core of Arreat. Balata, Act 5, Ruins of Corvus. Scarnax, Act 5, Ruins of Corvus. Bounty -- Lucious the Depraved, Act 1, Cemetery of the Forsaken. Bounty -- Digger O'Dell, Act 1, Defiled Crypt, dungeon below the Cemetery of the Forsaken. Bounty -- John Gorham Coffin, Act 1, Defiled Crypt, dungeon below the Cemetery of the Forsaken. Terror Demons and Enslaved Nightmares. Haures, Act 4, The Silver Spire Level 2. Bounty -- Grimnight the Soulless, Act 4, The Silver Spire Level 2. Aloysius the Ghastly, Act 3, The Keep Depths Level 2. Bounty -- Riplash, Act 3, Tower of the Damned Level 2. Bounty -- Grimsmack, Act 1, Festering Woods. Bounty -- Enkidu. Act 1, Festering Woods. Spawns as part of the Eternal War event. Bounty -- Lavarinth, Act 3, Rakkis Crossing. Spawns as part of the Blaze of Glory event. Gholash, Act 3, Tower of the Damned Level 1. Legendary Affix: Blood oozes from you. Bounty -- Percepeus, Act 1, Leoric's Hunting Grounds. Bounty -- Brakan, Act 1, Highlands Cave, dungeon below Leoric's Hunting Grounds. Spawns during The Apothecary's Brother event. Sarella the Vile, Act 1, Leoric's Manor Courtyard. Fixed -- Cultist Grand Inquisitor, Act 1, Halls of Agony Level 1. On that level every game in Story Mode or Adventure Mode. Bounty -- High Cultist Murdos, Act 2, Alcarnus. Bounty -- Jhorum the Cleric, Act 2, Alcarnus. Bounty -- Inquisitor Hamath, Act 2, Alcarnus. Bounty -- Demonika the Wicked, Act 3, Tower of the Damned Level 1. Bounty -- Kysindra the Wretched, Act 4, The Silver Spire Level 1. Bounty -- Lady Victoria, Act 5, House of Deep Sorrow, dungeon from Westmarch Commons. Axgore the Cleaver, Act 3, The Core of Arreat. Haxxor, Act 3, Tower of the Damned Level 1. Bounty -- Grimmaw, Act 3, Tower of the Damned Level 2. Bounty -- Khatun, Act 4, Gardens of Hope 1st Tier. Fixed -- Razorclaw, Act 4, Gardens of Hope 2nd Tier. (Fixed spawn in Story mode, as part of the Corrupt Growths Tier I sub-quest of The Light of Hope main quest. Bounty -- Mange, Act 1, Weeping Hollow. Bounty -- Burrow Bile, Act 1, Fields of Misery, Forlorn Farm event. Dreadclaw the Leaper, Act 1, Fields of Misery. Bounty -- Razormouth, Act 2, Black Canyon Mines. Evil Oliver, Act 1, Whimsyshire. Fixed -- Headcleaver, Act 1, Leoric's Passage. Fixed spawn in Campaign Mode, during the Explore Cellar sub-quest of The Legacy of Cain quest. Bounty -- Merrium Skullthorn, Act 1, Cathedral Level 2. Chiltara, Act 3, Caverns of Frost level 2, below Fields of Slaughter. Legendary affix: Teleport gains the effect of the Wormhole rune. Sartor. Act 5, Battlefields of Eternity. Magrethar, Act 5, Realm of the Banished area off of the Battlefields of Eternity. Legendary Affix: Smite jumps to 3 additional enemies. Grownfang, Act 3, Skycrown Battlements. Bounty -- Growlfang, Act 3, Arreat Crater Level 1. Gnawbone, Act 3, Tower of the Damned Level 1. Legendary affix: +20-30% chance to be protected by a wall of bones. Bounty -- Kankerrot, Act 1, Weeping Hollow. Fixed -- Manglemaw, Act 1, Defiled Crypt level 2, below the Cemetery of the Forsaken. (Fixed spawn on quest in story mode. Cudglearm, Act 1, Cathedral Level 2. (4): Attacks cause your followers to occasionally come to your aid. Ningish, Act 2, Sewers of Caldeum. Gryssian, Act 2, Dahlgur Oasis. Malfeas the Abhorrent, Act 4, Gardens of Hope 2nd Tier, Radiant Chapel. Bounty -- Sao'Thall, Act 4, The Silver Spire Level 2. Bounty -- Rhau'Kye, Act 4, The Silver Spire Level 2. Fixed -- Maghda. End dungeon in Alcarnus, Act 2. Often a bounty also. (3): Doubles Death's Breath drops. Midnight Sparkle, Act 1, Whimsyshire. Members of Team Unicorn: Miss Hell, R'Lyeh, Killaire and Maulin Sorely. Deadgrasp, Act 3, The Battlefields. Event -- Handible, Act 3, The Battlefields. Bounty -- Valifahr the Noxious, Act 3, Arreat Crater Level 1. Bounty -- Aspect of Destruction, Gardens of Hope 1st tier. Bounty -- Sledge, Act 4, Hell Rift. Bounty -- Hammermash, Act 4, Hell Rift. Beyatt, Act 2, The Lost Caravan dungeon below the Stinging Winds. Ashangu, Act 2, Dahlgur Oasis. Mundungo, Act 2, Dahlgur Oasis. Always near the center of the large waterwheel area, when it spawns. (2): -7% damage from ranged attacks. (2): -7% damage from melee attacks. Bounty -- Lord Dunhyld, Act 1, Defiled Crypt, dungeon below the Cemetery of the Forsaken. End target of The Matriarch's Bones event. Bounty -- Fecklar's Ghost, Act 1, Festering Woods. Bounty -- Hawthorne Gable, Festering Woods. Raziel, Act 2, Sewers of Caldeum. Shade of Nar Gulle, Act 2, Sewers of Caldeum. Bounty -- Spirit of Khan Dakab, Act 2, Tomb of Khan Dakab dungeon below the Dahlgur Oasis. Bounty -- The Archivist, Act 2, Archives of Zoltun Kulle, The Unknown Depths. Bounty -- The Tomekeeper, Act 2, Archives of Zoltun Kulle, Realm of Shadow. Fixed -- Ancient Guardian, Act 2, The Forgotten Ruins dungeon below the Dahlgur Oasis. (Fixed spawn in Campaign Mode, during The Forgotten Ruins sub-quest of the Betrayer of the Horadrim quest. Bounty -- Rockgut, Act 2, The Unknown Depths dungeon below the Archives of Zoltun Kulle. Bounty -- Thrum, Act 2, Realm of Shadow, dungeon below the Archives of Zoltun Kulle. Sarkoth, Act 1, Dank Cellar below Old Tristram Road. Gorathra, Act 1, Musty Cellar below Old Tristram Road. Thornback, Act 3. The Keep Depths Level 1. Bounty -- Kao'Ahn, Act 4, Gardens of Hope 2nd Tier. Bounty -- Oah'Tash, Act 4, Gardens of Hope 2nd Tier. Bounty -- Torchlighter, Act 4, Gardens of Hope first tier. Quest -- Vekriss, Act 5, Unearthed Ruins Level 2. (End boss of Covetous Shen's quest, The Jewel of Dirgest. Can only be done once, without Reset Quests. Fixed -- Belphegor, Act 5, Path of War. Story Mode only, encountered near the beginning of The Battlefields of Eternity quest. Event -- Emikdeva, Act 5, The Crag of Eternity off of the Battlefields of Eternity. Part of The Demonic Prisoner event. Event -- Volux the Forgotten, Act 5, The Crag of Eternity area off of the Battlefields of Eternity, where he spawns as part of The War That Time Forgot event. Event -- Keeper Hashemel, Act 5, Infested Ruins area off of the Battlefields of Eternity. (Spawns during The Cursed Crystals event. Borgoth, Act 5, Realm of the Banished area via the Battlefields of Eternity. Bounty -- Bholen, Act 3, The Keep Depths Level 2. Bounty -- Garganug, Act 3, Rakkis Crossing. Bounty -- Gorog the Bruiser, Act 3, The Core of Arreat. Bounty -- Glidewing, Act 1, Cathedral Level 1. Bounty -- Firestarter, Act 1, Cathedral Level 2. Event -- Sicklefang, Act 1, Fields of Misery. End boss of the Carrion Farm event. Bounty -- Hellscream, Act 2, The Unknown Depths dungeon below the Archives of Zoltun Kulle. Bounty -- Thromp the Breaker, Act 3, Skycrown Battlements. Bounty -- Obis the Mighty, Act 3, Skycrown Battlements. Bounty -- Bashface the Truncheon, Act 3, Stonefort. Bounty -- Bricktop, Act 3, Stonefort. The Crusher, Act 3, The Keep Depths Level 2. Event -- Busaw, Act 3, Rakkis Crossing. End boss of the Crazy Climber event, which can be a bounty. Event -- Chupa Khazra, Act 1, Southern Highlands, in the goat amphitheater. Bounty -- Lorzak the Powerful, Act 1, Southern Highlands. Event -- Skehlinrath, Act 1, Southern Highlands. When the event spawns, found in a hut in the circular goat fortress. Saha the Slasher, Act 2, Howling Plateau. Bounty -- Taros the Wild, Act 2, Howling Plateau. Bounty -- Erach, Act 2, Stinging Winds. Bounty -- Raiha the Vicious, Act 2, Desolate Sands. Chiltara, Caverns of Frost level 2, dungeon below the Fields of Slaughter. Scathach the Savage, Act 3, Caverns of Frost Level 2, dungeon below the Fields of Slaughter. Bounty -- Zelusa the Grasping, Act 3, Caverns of Frost Level 2, dungeon below the Fields of Slaughter. Bounty -- Zelusa the Grasping, Act 3, Icefall Caves Level 2, dungeon below the Fields of Slaughter. Event -- The Old Man, Act 1, Fields of Misery. Hidden Grove, spawns when the golden chest is opened. Bounty -- Killian Damort, Act 1, Cathedral Level 4. Bounty -- Belagg Pierceflesh, Act 3, The Keep Depths Level 3. Reduces the wrath cost of shield bash 40-50%. Bounty -- Captain Cage, Act 1, Cathedral Level 4. Event -- Enmerkar, Act 1, Festering Woods. Spawns during the Last Stand of the Ancients event. Captain Donn Adams, Act 3, The Keep Depths Level 1. A collection of images of Legendary Materials. Legendary Mats with "no icon" visuals during the RoS beta. Legendary materials briefly gave off the beam of light graphic during the RoS beta. Legendary materials were yellow-colored for a time during the beta. Reaper of Souls Legendary Crafting Material Challenge forum thread. This page was last edited on 24 July 2015, at 07:33.